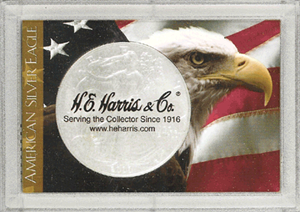 Patriotic 2" x 3" Frosty case coin holder for holding an American Silver Eagle. Show your patriotism while keeping your valuable ASE coin safe. Durable materials help protect and display your coin. A fantastic picture of a bald eagle and the American flag allow you to show your true colors.